There are two ways of adding database objects to the query. First, you can use the right-hand tree that displays database objects in a tree-like form. You can double-click objects or drag them to the query building area. To find the object you need, you can simply type the first letters of its name or scroll down the tree. The object within the tree can be grouped by Database, Schema, or Type. To remove an object from the query, select it and press the Del key or simply click the Close button in the object header. 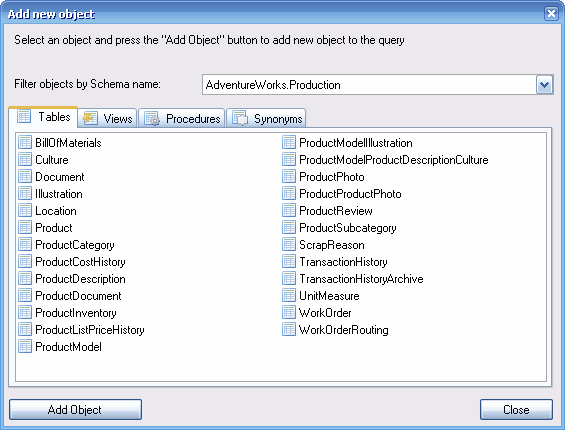 Second, you can right click the query building area and select the Add Object item from the context popup menu. The Add New Object window will appear. The Add New Object window allows you to add as many objects as you wish at once. The objects are grouped by type within four tabs: Tables, Views, Procedures (Functions), and Synonyms. You can select one or several objects by holding the Ctrl key and then press the Add Object button to add these objects to the query. You can repeat this operation several times. After you finish adding objects, press the Close button to hide this window. For those database servers that have schemas or allow for the selection of objects from different databases, you can filter objects by database or schema name by selecting the necessary schema or database from the combo box at the top of the window.